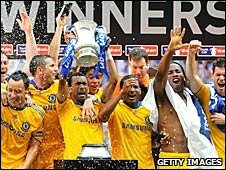 FA Cup holders Chelsea will kick off the defence of their trophy with a home tie against Watford in the third round. Ten-time winners Arsenal will travel to London rivals West Ham in what looks the tie of the round, while Liverpool travel to Championship outfit Reading. Leeds beat Kettering in their second-round replay to earn a trip to Manchester United. Aston Villa host Blackburn in one of three all-Premier League ties on the weekend of 2/3 January. The other, aside from West Ham-Arsenal, is Hull City's trip to Wigan Athletic. What do you think of your team's draw? Chelsea manager Carlo Ancelotti meanwhile is hoping that his side's clash with Watford will give him a chance to meet one of his heroes - musician Sir Elton John. John is the former chairman of the Championship side and Ancelotti is a huge admirer. "I do not know Watford very well at the moment but I will have the opportunity to learn about them," said Ancelotti. "The owner of Watford many years ago was Elton John. Elton John is my favourite singer. The match will be an opportunity to meet Elton John." Other intriguing ties see Manchester City travel to Middlesbrough, Tottenham host Peterborough United, and League One outfit Carlisle drawn away to Everton.